Photos by imprisoned Egyptian photojournalist Mahmoud Abou Zeid featured in a Bronx Documentary Center exhibition. 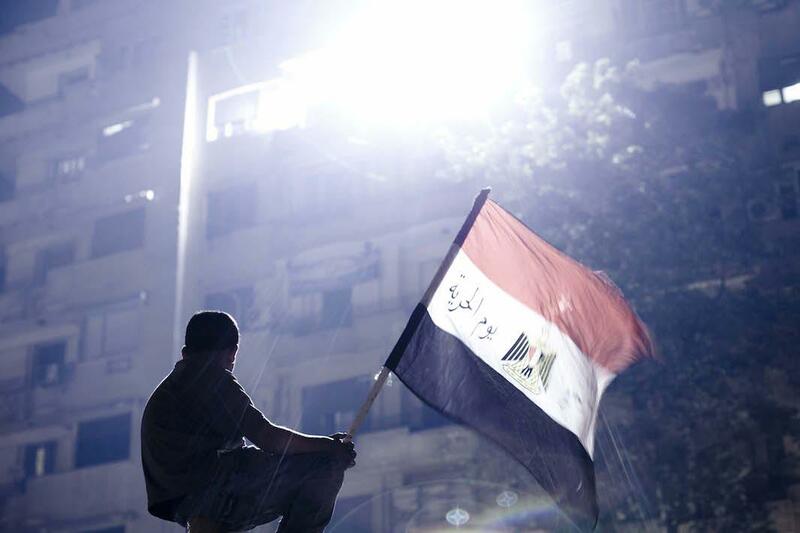 Boy, flag, streetlight, Cairo, 2013. When supporters of ousted Egyptian President Mohamed Morsi clashed with Egyptian security forces on Aug. 14, 2013 in Cairo’s Raba’a Al-Adawiya Square, freelance photographer Mahmoud Abou Zeid, better known as “Shawkan,” like any other working journalist in the city, was there to cover it. The clashes turned violent, and hundreds were killed. Shawkan, meanwhile, was detained with journalists from France and the United States. While they were eventually released, Shawkan was not. He was charged, along with hundreds of protesters, with weapons possession, illegal assembly, murder, and attempted murder—all of which he has denied. “The court and the judges have so far refused to acknowledge his situation as a journalist, as someone there doing his job, or to release him on bail. The sessions continue to be postpone—they’re still in pretrial motions—and it’s moving very, very slowly. In most court sessions the authorities have failed to move the defendants in prison to the court room,” El-Rifae said. 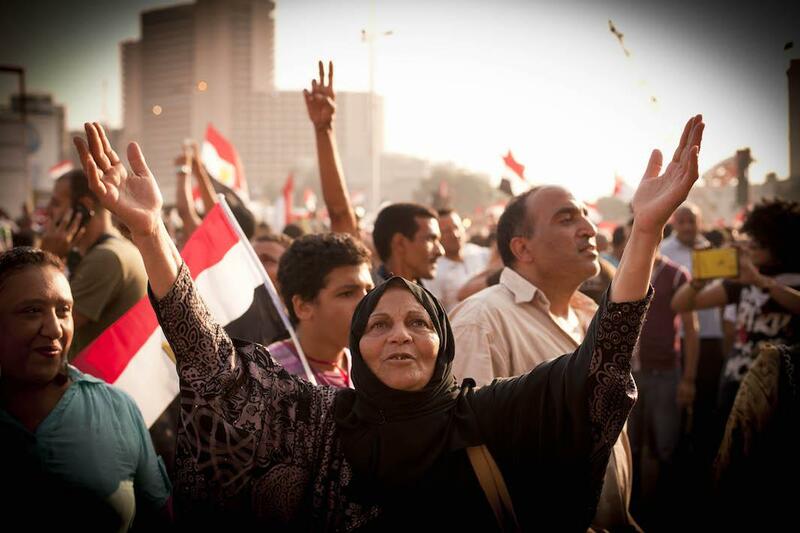 A woman holds up her hands in a chant during protests in Tahrir, Cairo, 2013. 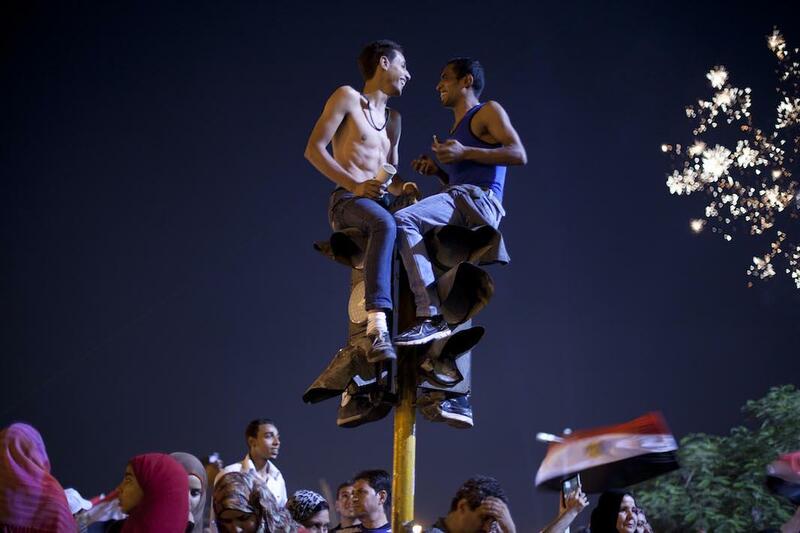 Chatting on top of a traffic light during a rally against the Muslim Brotherhood government, Cairo, 2013. In 2011, Tahrir Square filled with protesters demanding the ouster of President Hosni Mubarak and calling for bread, freedom, and social justice. 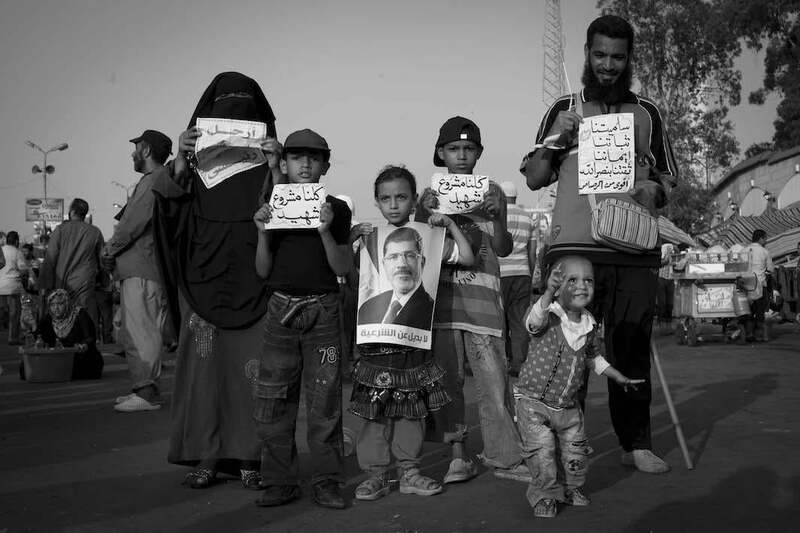 A family in support of ousted President Mohamed Morsi at the Raba’a Adawiya sit-in before it was violently dispersed, Cairo, 2013. To advocate for his release and bring attention to the increasing perilous climate for Egyptian journalists, CPJ is showing some of Shawkan’s work in a free exhibition, “The Price of Photography: Shawkan, 1,000+ Days Behind Bars,” at the Bronx Documentary Center, on display from Thursday until Sunday. “We see this as a situation where [Shawkan] was at the wrong place at the wrong time, had a camera on him, got arrested, and just didn’t get let out. I think with enough pressure and enough publicity that could encourage the authorities to let him go. It’s in their interest at the end of the day. It makes the Egyptian government look better to let someone like him out,” she said. The idea for exhibition, El-Rifae said, is to highlight Shawkan’s talent and to demonstrate the diversity of his work. There are images that show protests and clashes in the Egyptian revolution, but there are also photographs that capture the joys and color of everyday life in Cairo. “With everything that’s happened in Egypt in the last few years, there’s something special about seeing images from a time that was much more hopeful in Egypt. 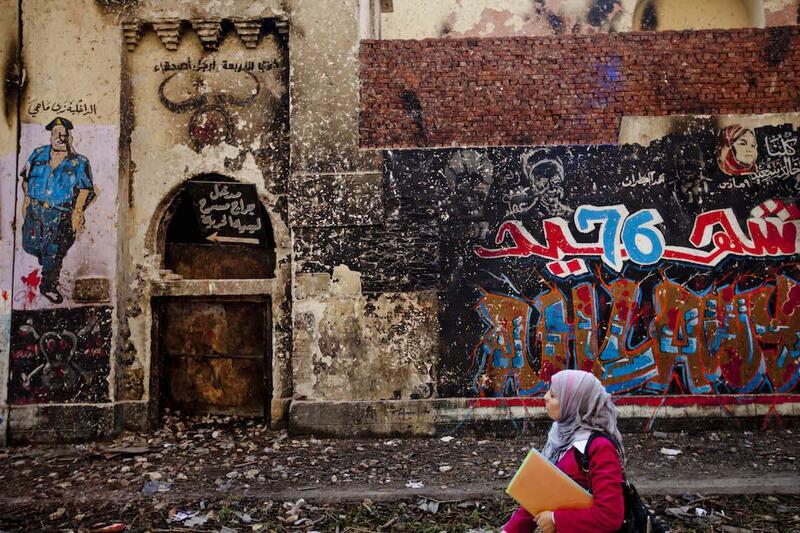 Most of these images were taken in the years of the revolution in Egypt before his arrest. There’s a vibrancy and optimism that’s very naked in these images that we haven’t seen in a long time,” she said. Graffiti about police brutality, Cairo. 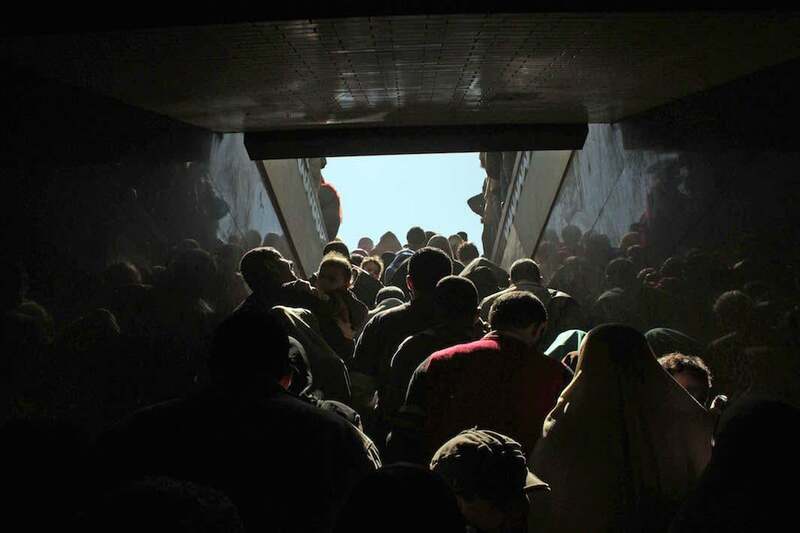 Emerging from a Metro station, Cairo, 2011. 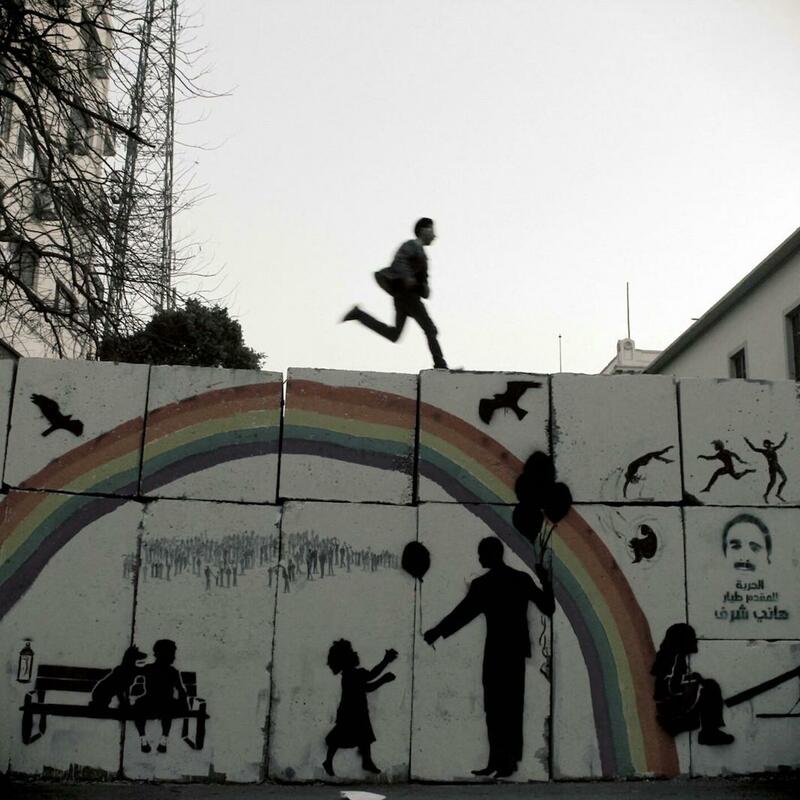 Graffiti covers a concrete wall built by security forces to prevent protests, downtown Cairo, 2011–12.